I'm posting again tomorrow about the girl that makes the most beautiful wallets in the planet, the book giveaway, a little typo and a little better Pablito the Penguin's arms'explanation. Thanks for the little bear!! Thanks for the honey bear, it's adorable as usual. I hope March is a much better month for you. oooh! thank you so much! ^_^, really really thank you! beautifull like all your art work! kisses! Super sweet little bear. Thanks for sharing it with us all. Your blog is SOO wonderful! I'm so glad I found it! I'm going to have to go through and find tons of patterns to make this weekend! My phone needs a ton of cute charms and my work bag needs some additions to it! Thanks again for your inspiration and lovely little friends. I just had to make one of these little bear with his honey pot. He will be a birthday present for Liam 4. Thank you so much for all the adorable patterns. 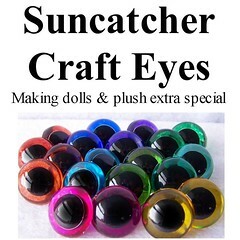 I have had a lot of fun making them and sharing your blog. 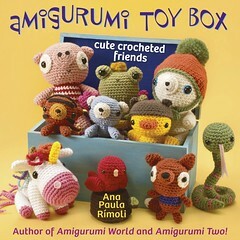 i will try to make this darling little guy...then if i make it through, i will for sure buy your darling book! Hola, me encantó tu blog y amé tus trabajos. Me hubiera gustado que se vendiera tu libro en mi país =(. Por eso mismo estoy muy agradecida de tus patrones. Viendo las cosas que haces me animé a intentar hacer este osito tan tierno, pero al parecer tengo problemas con el tamaño del crochet. Qué significa F5? Es una medida especial? Fui a una tienda especializada en este asunto, pero parece que la chica que me atnedió no sabía mucho.. Al final terminé comprando un gancho de 5 mm. Es ese el tamaño correcto? De nuevo, muchas gracias por hacer las maravillas que haces. I gave it to my mom and now my brother wants one and I have to make another for my grandmother! First I'd like to say that you are very talented. 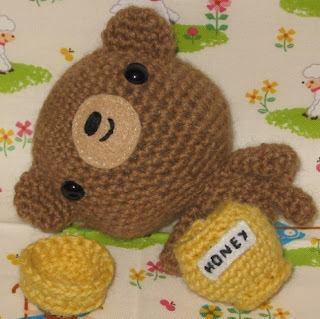 I'm attempting my first ami and I have a question regarding R22 in the Bear and Honey pattern. I don't understand what it means by *sk 1 st, sc 1. what does "sk" mean? I don't understand how to get from R21's 12 stitches to R22 6 stitches. I've tried to do 1 sc, and 1 dec, but I end up with 9 stitches. Sorry for being such a beginner. Thank you so much for the pattern. I like it a lot. Please allow me to create link to your blog in mine. It´s lovely! Thanks for the pattern. Hey I have a question. I pretty much did fine until i hit R7-16. does this mean i have to do 324 stitches in all until i get to do R17? or do i just do 36 sc? Please help me out i would be very happy if you did! 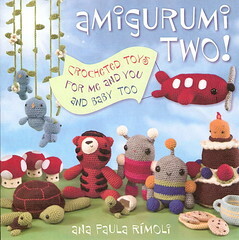 Your amigurumis are so cute! that means 360 simple crochet stitches in total. I just found this free pattern and it says "R4- Through back loops only: *Sc 1, dec 1*, repeat 6 times (12 sts)" I thought I did it right but it turned out weird-looking. Could you explain to me where the back loops are? 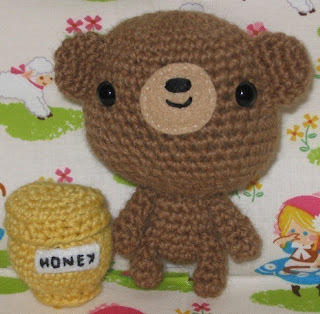 Can you help me?This is regarding the bear and pot of honey pattern.Can you please explain how to do the pot part?I tried 2day and my pot looks differnt than the picture Can you explain this?????? So cute! 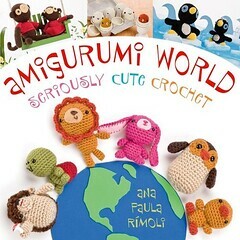 I'm making this along with some other little animals for a birthday present and it's perfect! I made matching teddy bears for my boyfriend and I. His is brown, mine dark purple (those are the colors I had). This is my first attempt at follwing any kind of pattern and I must say it was very simple and easy! It also kept me occupied when I was snowed in for 3 days. :) Thank you so much for sharing and I will post the pictures as soon as I get some felt and little eyes! I dont know if this has been mentioned, but you left off the part where you tell us to put the eyes and nose on, I almost forgot! Thanks for the pattern! I've translated this pattern and posted it on my blog. I also linked to your blog! Thank you for this free pattern. I recently learnt to crochet and saw your adorable creations, so thought I would have a go of the little bear before deciding if I'd buy your (first) book. It came out fairly well. I didn't do the honey pot and my bear is rainbow coloured. It brings a smile to my face each time I look at it. I had a little trouble with the legs and arms(a bit too thin for my skill level), so did thicker ones from the bunny pattern. I was stoked with how it turned out, so ordered the book today from amazon. Thank you again for sharing your patterns. They are so adorable. 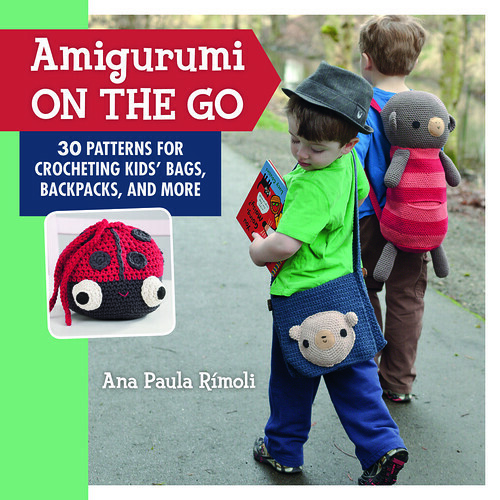 hi,ur blog is great and thanx for sharing those free patterns!! I have tried to make a bear like this before from one of your books but my brothers and sisters broke it. Thank you for the pattern, I like others am on low income and appreciate the free pattern. I will make up as gift for family and charity. God Bless. What a cute amigurumi teddy! You are so gracious to share your talent and the pattern with us all. Thank you! How tall is the little fellow? Making one for my ill baby siter. Making the Chocolate cup too.